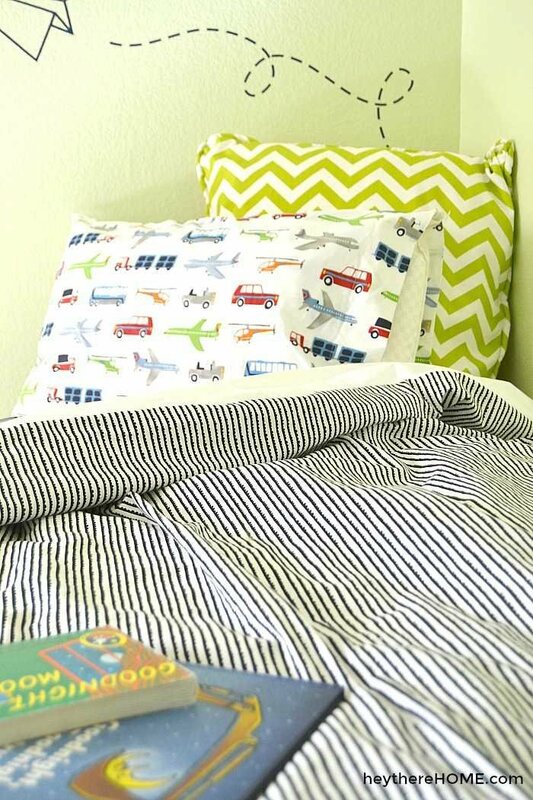 Inside: Making a twin duvet cover is a perfect simple sewing project, even for a beginner! Easy step-by-step instructions! If you’ve ever found yourself putting off revamping a room because you can’t seem to find exactly what you’re looking for, you’re definitely not alone. So I set out to make my own twin duvet cover for his new twin sized bed and got to browsing my favorite fabric site, Fabric.com. So today we’re teaming up to show you how to make a twin duvet cover. 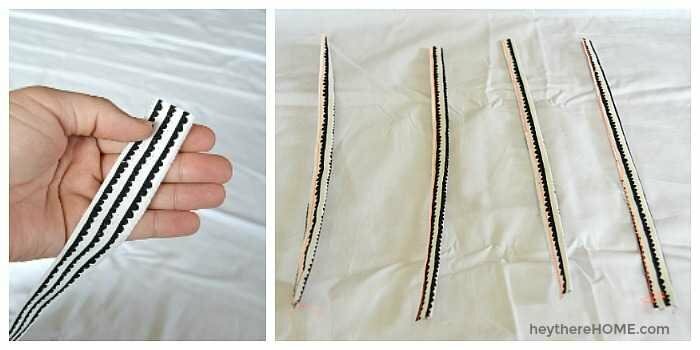 I know it seems like a big project, but beyond the actual size of the project itself, this project is really very easy and a perfect simple sewing project, even for a beginner. 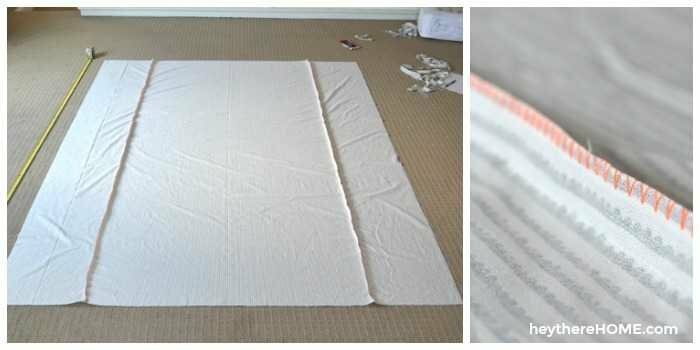 If you can sew a straight line, you can make your own duvet cover. Since most fabrics come in widths of 44-52 inches we are going to create panels to get the width we need. Your width will depend on the size of your duvet insert. I’ll be using my twin sized insert (that is 66 x 88) as an example. The black and white scallop stripe fabric that I used for this project can be found right here. This is my go to sewing machine for home decor projects. It is inexpensive, uncomplicated, and can sew through thick fabrics or multiple layers with no problem. Take the dimensions of your duvet insert and add 4 inches to both numbers. So if my insert is 66 x 88 adding 4 inches would give me 70 x 92. 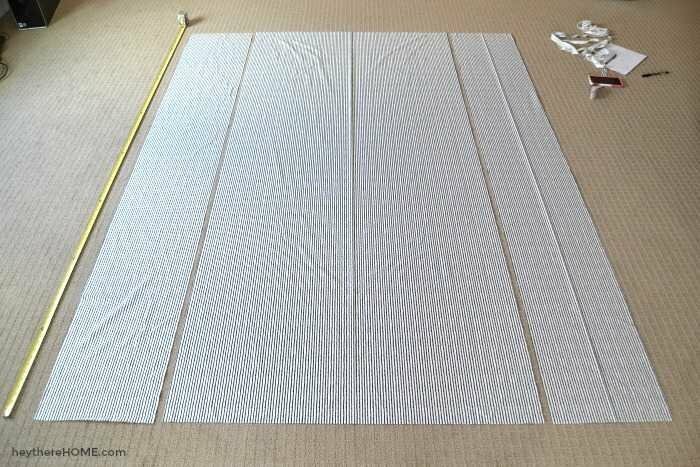 Your middle panel will be the width of your fabric. The two side panels will be the remaining width needed divided equally. Take the width of your fabric and subtract it from the width you need. Once I cut my fabric to create super clean edges it was 42 inches wide. Example: 70 – 42 = 28. Then divide that number by 2 to give you the width of each side panel. Example: 28 ÷ 2 = 14. So my middle panel will be 42 inches wide and each of my side panels will be 14 inches wide. With your 3 panels laid out flat (good side up) fold one side panel over onto your middle panel so that the good sides are touching and pin down the edge. 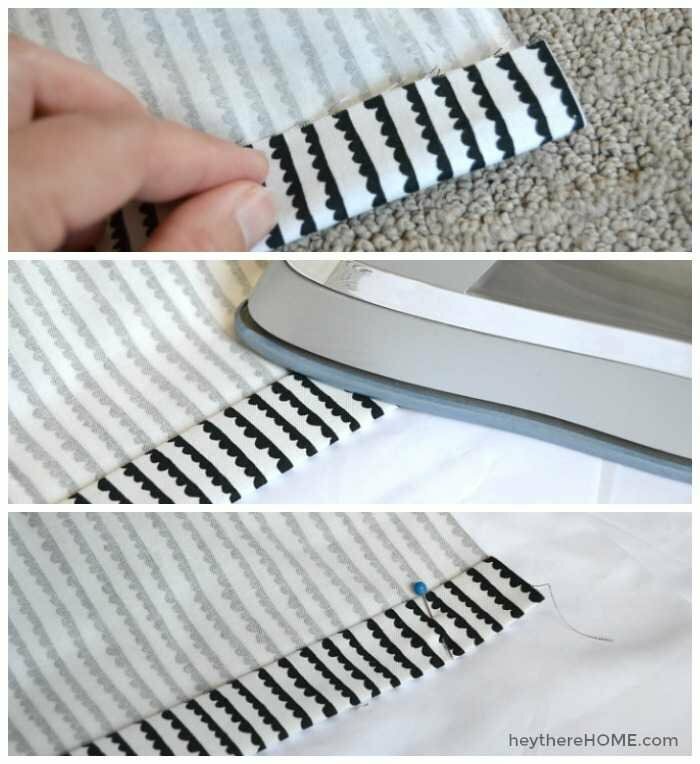 Sew along the edge with a 1 inch seam using a straight stitch. Repeat this step for the other panel. With your the top layer of your duvet cover face down and laid out flat, decide which end will be the bottom of your duvet cover. Fold the edge of that side in one inch, and then again one inch and iron flat. Pin along the edge to hold it in place. Sew along the seam to create a finished edge. 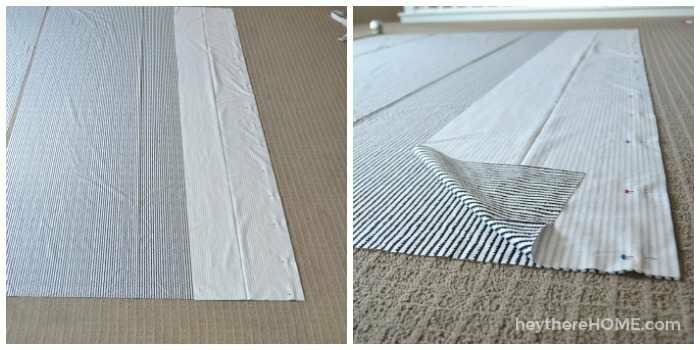 Cut your flat sheet to the same width as your top layer, then with it laying out flat, lay your top layer on top of it, good side down, and line up all of your edges. Your flat sheet will be longer than your top layer. Leave the excess length laying flat on the same side as your finished edge of your top layer. Then fold the excess length under (toward the floor) to make it the exact same length as your top layer. This will create a pocket inside your duvet cover for your duvet insert so that it stays in place nicely. Be sure the fold of your flat sheet is straight and even all the way across and pin around 3 sides of your duvet cover leaving the finished/ folded edge open. Step 6: Make ties to keep your insert in place. Take about a 48 inch strip of extra fabric (or ribbon if you don’t have extra fabric) and fold it in half length wise. Run it through your machine along the edge. Then cut it into about 6 inch pieces. 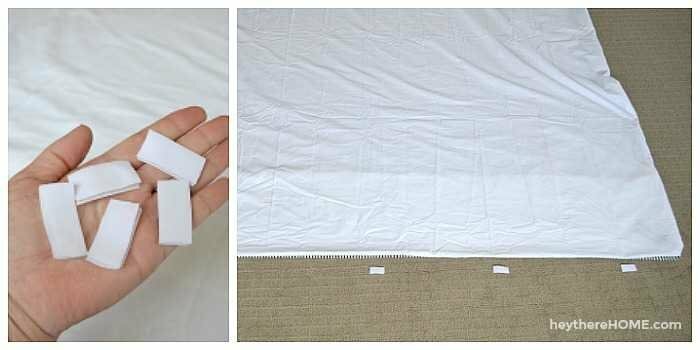 With your duvet cover still inside out, fold each strip in half and open slightly (you’ll have a V shape) and place the point of the V in each corner on the flat sheet side. Run it through your machine to hold it in place. On the side with the pocket, you will have to open up your pocket a bit and sew your strip into the corner where the corner of your insert will go. 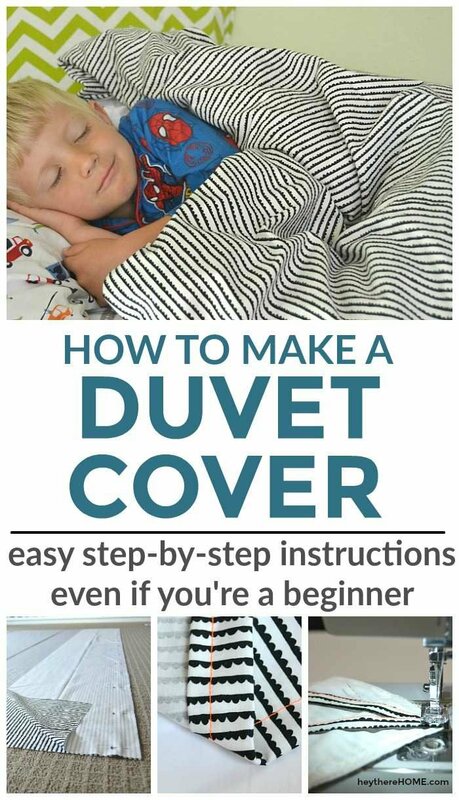 Make your duvet right side out before going to the next step. Cut five 1 inch pieces of hook and loop (Velcro) and place them along the open edge to plan the spacing. 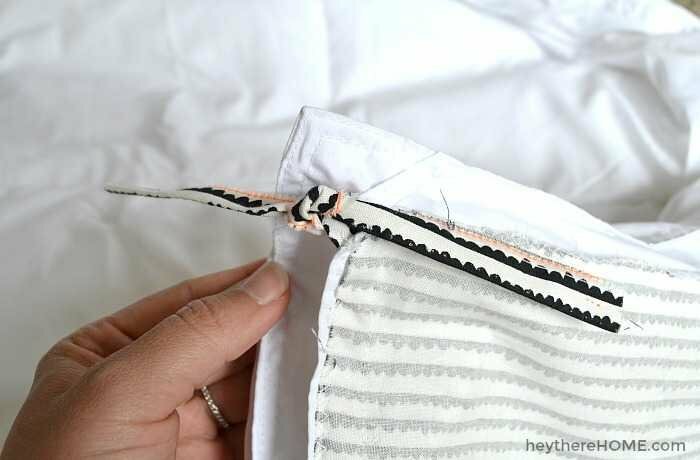 Lift your opening open slightly and pin the hook side of your hook and loop piece along the inside of the finished seam. Pin the loop side of your hook and loop piece along the inside of flat sheet side in the same spot so that when they lay flat, they attach. 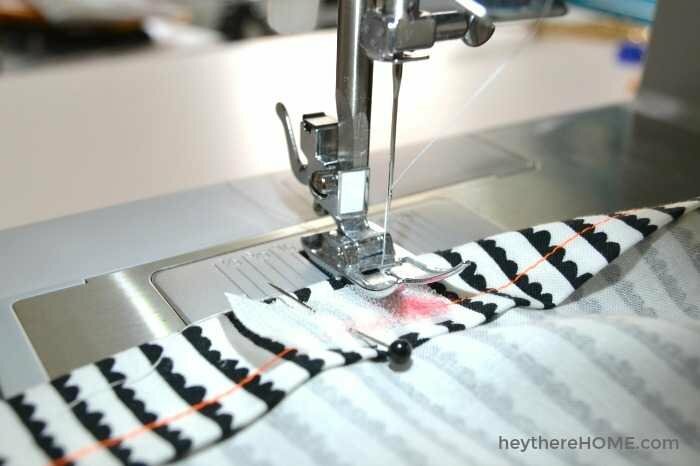 Sew each rectangle of your hook and loop in place. This part can be a bit awkward because you have to change directions often. 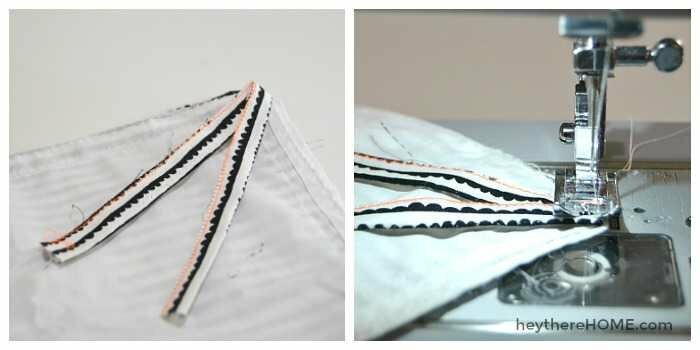 Be sure to leave your needle down each time you turn and bunch up the excess fabric just enough to get to the next edge. Turn your duvet cover inside out one last time and lay it out flat with the flat sheet side/ side with your ties on it facing up. Lay your insert on top of it with the attachment tabs facing down. 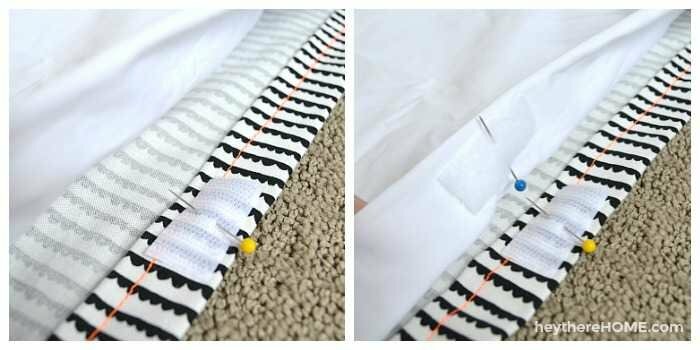 (If you don’t have attachment tabs, you can sew some onto your duvet insert easily using a strip of scrap fabric and sewing it on at a diagonal at each corner. 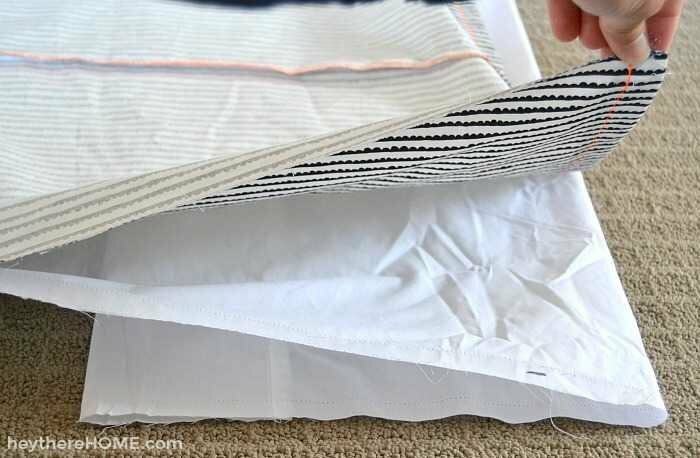 Tie your duvet cover to the tabs on the insert. On the pocket ends, put the edge of your insert into the pocket and then tie. Now your insert won’t shift around inside your new duvet cover! I have to say I’m so excited to finally have my little boy’s big boy room started and he is so excited too! His new mattress is so comfortable and the new best place in the house to snuggle up and read. 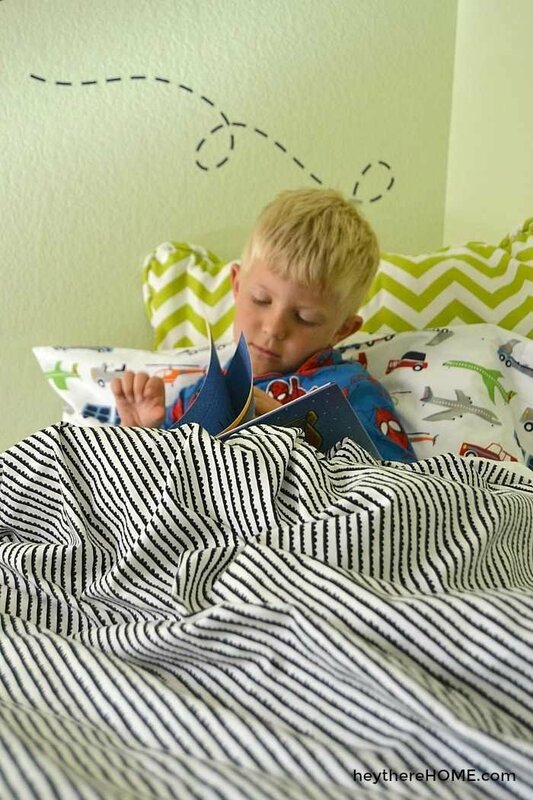 Making his twin duvet cover allowed me to get the exact look we were going for and choosing a print that is simple will ensure that he doesn’t outgrow the theme of his bedding. It will just be a matter of switching out the sheets as his tastes and interests change. Yep! He’s already loving it! Last night when I was tucking him in for the first time he asked me if it was okay if his feet didn’t reach the end of the bed. Clearly he was getting far too big for his toddler bed. hahahaha! A big THANK YOU to Fabric.com for sponsoring this post. As a long time loyal customer I’m honored to work with them. Thank you for sharing! I love the fabric you’ve chosen!! Thanks for stopping by Yasmina! Yours will turn out awesome! Nice Tutorial with pictures. Makes it easier to me. the Duvet cover looks really amazing. Hey Dana, you can modify the instructions and increase the fabric to make any size duvet you want! Bet yours will turn out fantastic! 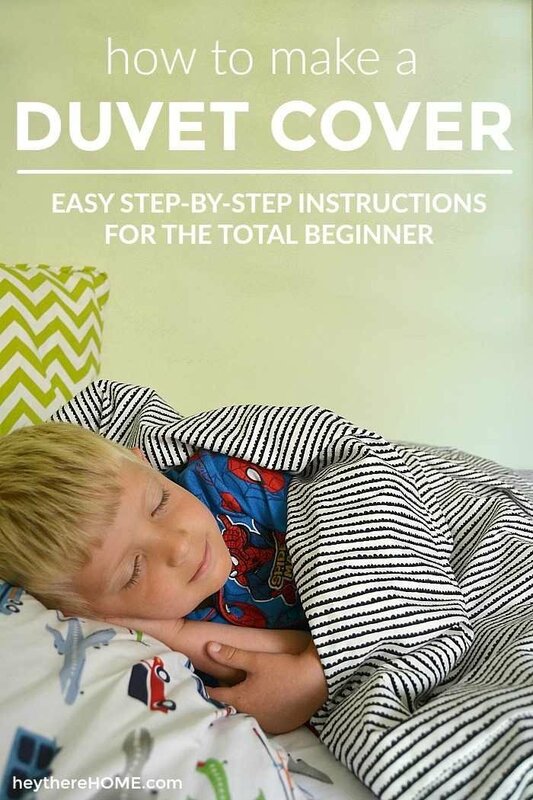 tips, I particularly enjoyed learning about how to make a twin duvet cover If you have any more easy sewing projects for beginners like me please don’t hesitate to share the love! I have a 5 year old daughter and she’s super sassy! I would love to make some totally adorable spring/ summer get ups for her this year and I know she would love it too! Thanks Corey in advance! I love this duvet cover! Looks beautiful. What a wonderful and easy to follow tutorial. Thank you, Mary! I hope it helps you create your own beautiful duvet!